Today we participated in peer feedback sessions. First the group was divided in to two, then we each took turn to present our initial proposal, and research collected up to this point. 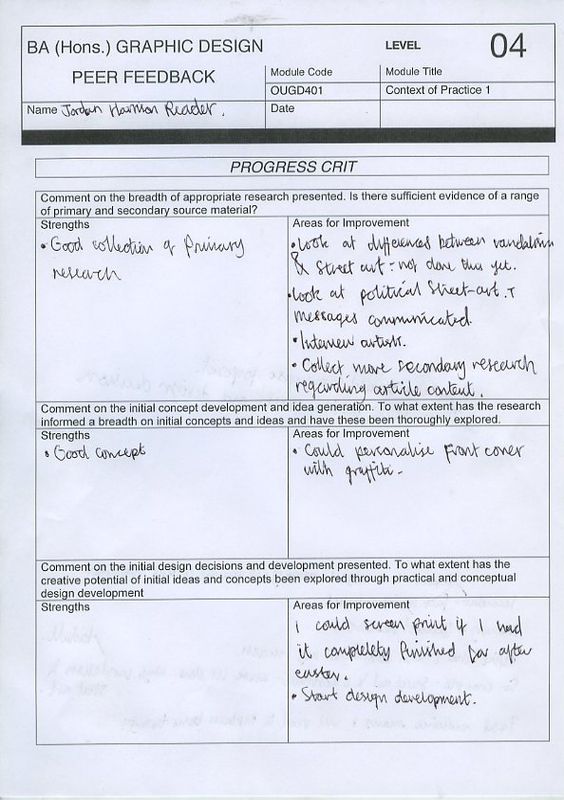 After we finished presenting members of the group gave feedback which was noted down on our progress crit sheets. 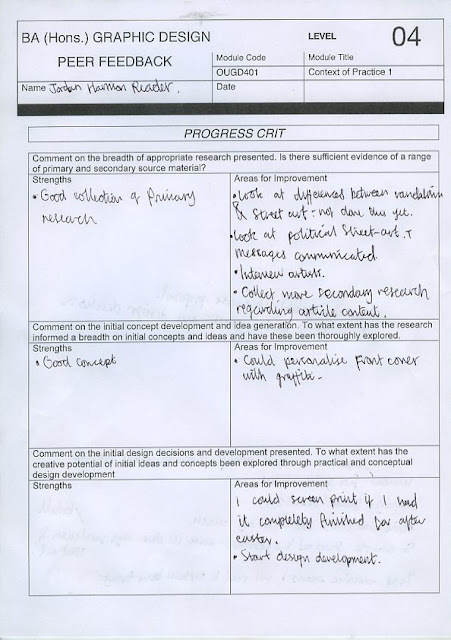 To improve my research I need to collect more secondary research regarding the content of my article. At this point in the project I have defined my target audience as middle aged people who would usually ignore street art, this has defined the content and form of my publication. Additionally, I also defined four points of focus that will be discussed in the article to help communicate the intended message. It was mentioned that to progress I need to further inform myself about these four points of focus. I should email street-artists and try to conduct a email based interview. This will enable me to define what street artists think about their work and its effect on society. It was stated that my concept is strong, as I have defined my target audience and thought about what I want the publication to achieve. I should consider a personalised cover design that is relevant to the outcomes content. I mentioned in the crit that I considered printing my outcome on black stock, the group urged me to do this which got me thinking if it would be possible with the amount of time left before the module submission.